I love brussels sprouts. Weird, right? The first time I ever ate this vegetable, they had been cooked by steaming them whole. I took one bite, and spit it out in disgust. I vowed never to eat them again, figuring there were plenty of other vegetables I could tolerate; although at the time, the list of veggies that I actually liked was small (turns out corn covered in margarine does not a healthy meal make). After I transitioned to a more Paleo/Primal lifestyle, I realized I needed to start loving veggies, since they would play a much bigger role in my diet. I started of with simple things like salads and frozen green beans. But that wasn’t doing it for me. I needed more flavor and more variety. A whole new world opened up for me when I started roasting vegetables. Roasted zucchini, roasted spaghetti squash, roasted broccoli, roasted green beans, it seemed I couldn’t go wrong with roasting (probably because roasting brings out the natural sugars, and I admit to being somewhat of a sugar addict). Which brings me back to brussels sprouts. I discovered a tip for cutting them in half before cooking them so that they are less bitter, and decided to give them another chance. Roasting the halved brussels sprouts (before roasting them I tossed them in a mixture of olive oil and balsamic vinegar) forever changed my world, and I now typically eat roasted brussels sprouts at least once or twice a week. So what does that have to do with roasted cauliflower? Nothing actually. Okay, just kidding. For people who don’t like veggies (or think they don’t like them), I would recommend finding different ways to prepare them. It may not be about the veggies themselves, but instead it may be how they are prepared, since different cooking methods can greatly affect both taste and texture. I initially felt the same way about cauliflower as I did about brussels sprouts. But I’ve since learned a variety of ways to cook cauliflower, making such recipes as cauliflower mashed potatoes, cauliflower pizza, cauliflower soup, and cauliflower bread sticks. Another secret to enjoying veggies is covering them in ghee (or butter, depending on whether you have any dairy sensitivity). 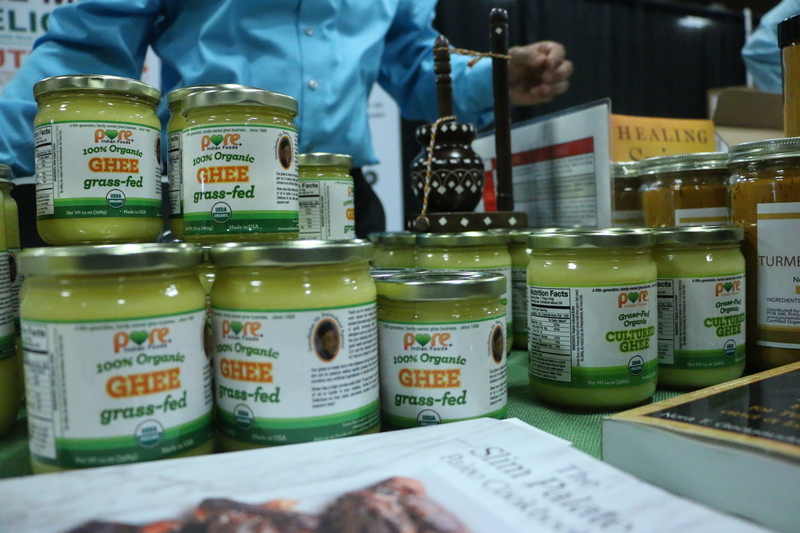 What is ghee, you may ask? It is a type clarified butter, made by heating butter until the water has evaporated, and the milk solids have browned, which gives ghee its nutty flavor. For more information about ghee and its benefits, check out Stephanie Gaudreau’s take on incorporating ghee into a healthy diet on her blog Stupid Easy Paleo. When I went to Paleo F(X) back in April of 2014, I checked out a booth hosted by Pure Indian Foods. 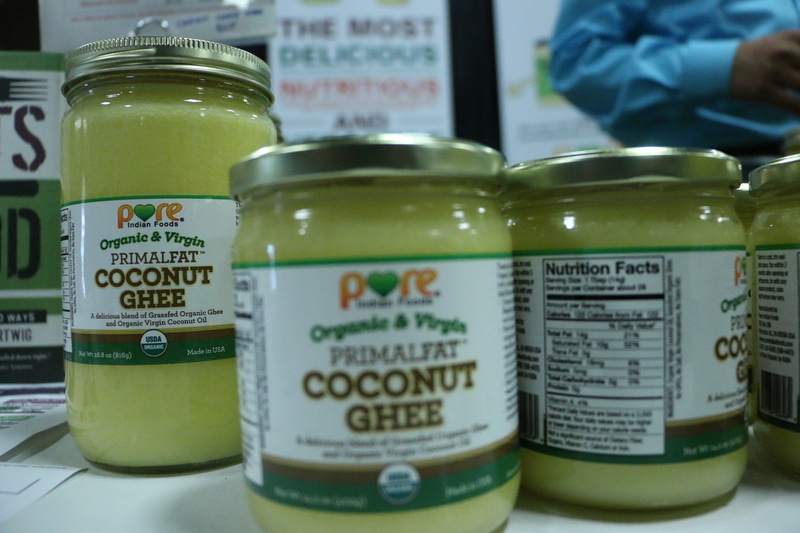 Pure Indian Foods is a company that makes several different types of products, but is known for its production of ghee. and something truly unique, a mixture of coconut and ghee (a 50/50 mixture of organic grass-fed ghee and organic virgin coconut oil). After answering several of my questions about the company’s products, the owner of the company graciously provided me with a jar of ghee to try out. 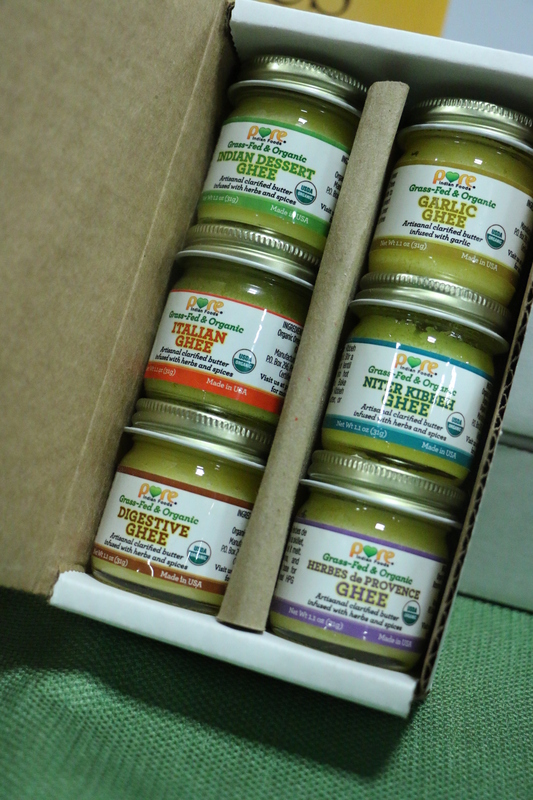 And after seeing all of the different spiced ghees available, I went head and purchased a sample package of the different flavors – with flavors like garlic ghee and italian ghee, I just couldn’t pass them up! 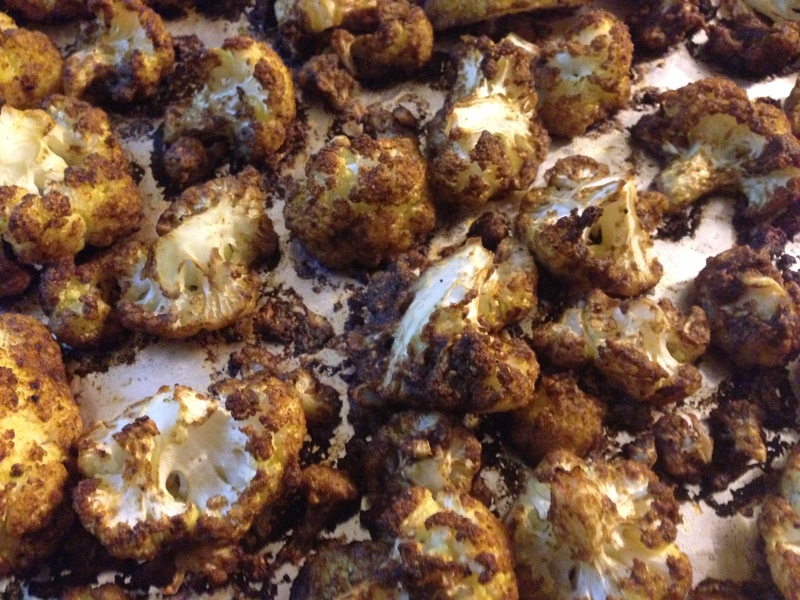 Although I have learned many different ways to use cauliflower, roasting is usually my go to method for cooking them. This simple recipe for Indian Spiced Roasted Cauliflower is a great addition to any meal. I like to pair them as a side dish with chicken tikka masala. I incorporated Pure Indian Foods grass-fed ghee into the recipe, and it did not disappoint! 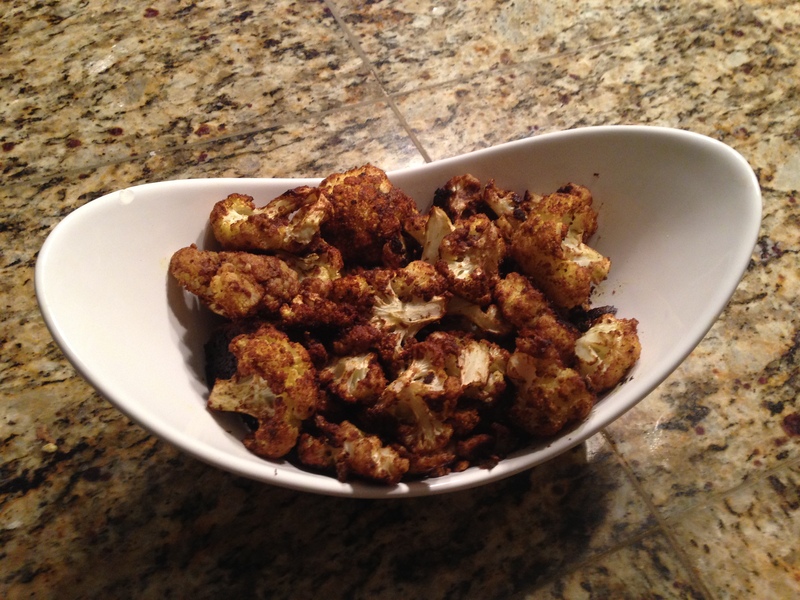 Indian Spiced Roasted Cauliflower – recipe adapted from Oroville Crossfit. Place cauliflower florets into a large mixing bowl. Place the remaining ingredients in a small mixing bowl, and stir thoroughly until combined. pour the mixture over the cauliflower florets (mixture will be thick), and toss to coat. Pour the cauliflower onto the lined baking dishes, and spread out evenly so that the cauliflower florets are not too crowded. Bake in the preheated oven for 40-45 minutes. You can substitute melted butter for the ghee. Tags: cauliflower, clarified butter, ghee, Gluten-Free, grain-free, Indian spices, paleo, Primal, roasted vegetables, side dish, sides, vegetable, vegetarian | Permalink.